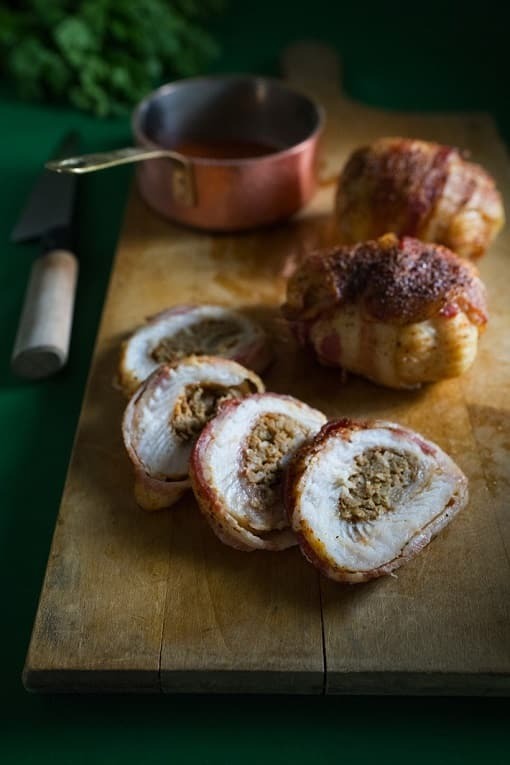 Seasoned catfish that is wrapped with bacon, stuffed with Cajun boudin, baked for about 25 minutes, serve and enjoy! Preheat oven to 400° Remove boudin from casing and divide into 4 portions. Lightly dust fillets with seasoned salt, or your favorite Cajun seasoning. Place fillets flat side up. Place 1 portion of boudin in middle of each fillet. Wrap thin side of fillet toward center, then thicker side toward center. Secure by wrapping 1 slice of bacon across the 2 ends of the roll. Then, wrap another slice of bacon around, so it crosses previous slice. Secure with toothpicks, if necessary. Sprinkle with seasoned salt, or your favorite Cajun seasoning. Bake rolls on a wire rack on a sheet pan for 25 minutes. Remove from oven and let cool for 10 minutes. Remove toothpicks and slice rolls before serving. Serve with this close clone version of Bennigan's Potato Wedges if desired.